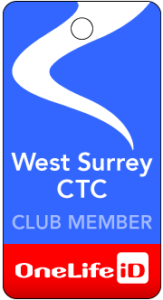 The following is my personal view, independent of West Surrey CTC committee. At last year’s AGM a motion was passed requiring candidates for election as trustees to have been CUK members for at least a year. When the elections came round, this motion was ignored – half the candidates were not members at all, and the names of some candidates who had a right to stand never made it on to the ballot paper. This year’s agenda includes a number of resolutions relevant to the relative power of members and trustees to influence CUK policy, i.e. concerning how democratic our organisation is. I appreciate that many of you just want to get on with riding your bikes, but I appeal to you to consider just 3 of the 15 motions and vote as follows. Motions 5 and 7 are designed to suppress opposition from ordinary members; please vote against them. Motion 11 is designed to provide a means to question undemocratic action by the trustees; please vote for it. If you nominate the Chair as your proxy (the default option), please vote ‘abstain‘ for all motions you wish neither to support nor to oppose, otherwise you will automatically support the board of trustees. The AGM is on Saturday (13th) in London (should you wish to go), and the deadline for electronic voting (should you not wish to go) is 9 a.m. on Thursday (11th), so find the sheet of paper that covered your latest ‘Cycle’, find therein the relevant Electoral Reform Society web address and security codes, and get on your computer/phone.